Internal size approximately 12.99″(H) x10.63″(W) x4.72″(D); Outer size: 15.35″(H) x11.42″(W) x5.91″(D) cm. Can hold up to 1 camera, 5 lenses. Front pocket for tablet up to 9.7″. Inner compartment and interior dividers uses Velcro closure, which can be taken apart and recombination easily, to be used as a general bag. Enough space for store accessories such as filters, battery, charger, memory cards, cables, twin-lens, etc. Shockproof foam padding with 0.59″ thickness. Protects your camera from scratches and dusts; Great travel companion for photographers, photojournalists. Perfectly fit your device. Water-repellant nylon heavily reinforced stitching and expedition-grade harnesses and shoulder straps. Shockproof removable Velcro PE pads & Adjustable padded dividers. Compatible with Canon, Nikon, Sony, Olympus, Pentax and other DSLRs and photographic equipment. The bonus raincover would be the best to protect against rain, moisture and sunshine. 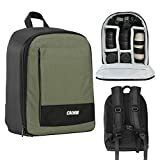 This professional Caden Camera Backpack Bag with ultra-large capacity and good capability for waterproof & shockproof is perfect for photographers, photojournalists. It’s safe and comfortable way to transport camera gear and essential for outdoor filming. * Interior mesh pocket to put filters, pens, maps, card readers, chargers, etc. Camera, lenses, and other things shown are NOT included. This entry was posted in Discount Photography and tagged 15cm, 29cm, 39cm, Accessories, ArmyMilitary, Backpack, Black, Caden, Camera, Canon, Capacity, Case, Cover, DSLR, Gear, Green, Laptops, Multifunctional, Nikon, Olympus, Outdoor, Photography, Rain, Rucksack, Shockproof, Size, Sony, Tablets, Travel, UltraLarge, Waterproof by Ball Photo. Bookmark the permalink.